VSNK-TBSTYL Table Size - 213 CM x 116 CM x 78 CM, Comes with 2 Pcs Cues 144 CM Length, 1 Set of 57 MM Pool Balls, 1 Pc Triangle, and 2 Pcs Chalks. 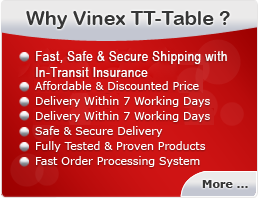 Vinex Pool Table - Stylus is a perfect model to be used at Shopping Malls, Universities & Colleges, Corporate Offices, Sports Clubs and other places for fun purpose. This pool table is made of top quality laminated MDF board that offers superb strength and durability. The top is covered with special durable fabric. It comes with internal ball collection system. Its base frame is also made of MDF board. Levelers are available for level adjustment, for a genuine playing experience. This table is very easy to assemble.